A mix of tart and sweet apples are wrapped in cream, vanilla, and cinnamon and baked in a crust that tastes like a big oatmeal cookie in this delicious autumn dessert. 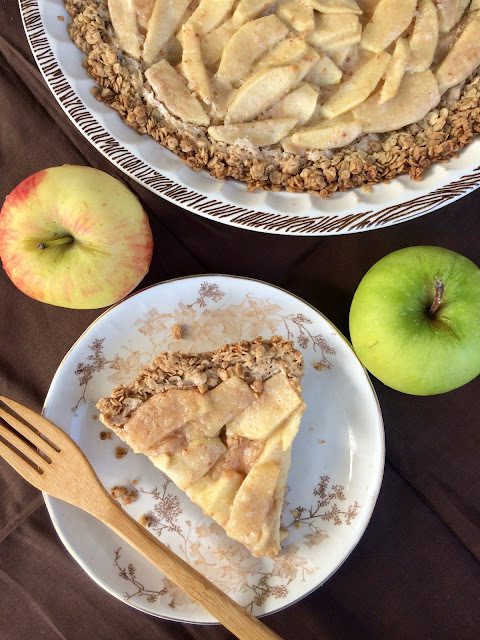 This pie is closing out my #AppleWeek recipes and it's worth the wait! I hope that you are all loving #AppleWeek as much as I have been. I felt that doing a week of apple recipes just wouldn't be complete for me without a new pie recipe. Pies are kind of a thing with me. I enjoy trying out all different pie filling flavors, but also different types of crusts. I was really nervous about this pie - very unsure if the oatmeal crust would work, but it turned out perfectly! We decided that it tastes like a giant oatmeal cookies and a big bonus is that it's a snap to make - no chilling, or rolling, or using a food processor for this crust! 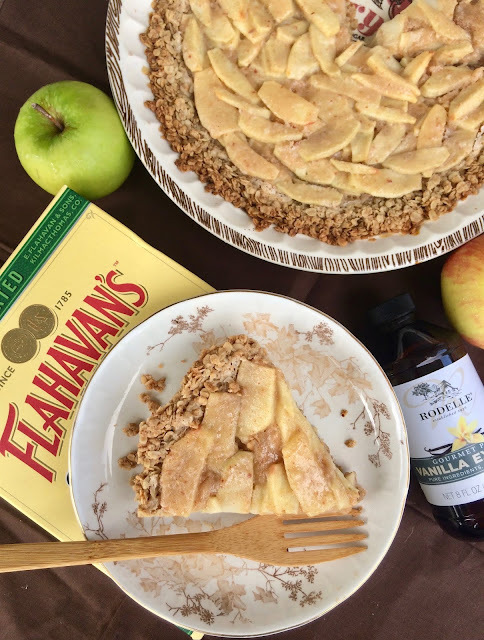 The apple cream filling was kept very simple with a hint of cinnamon and some deep vanilla flavor using Rodelle's gourmet pure vanilla extract and the crust is made with Flahavan's Irish Oatmeal. Apples, oats, and vanilla are a lovely flavor profile. You can't beat the vanilla flavor you get with Rodelle's pure vanilla extract. And, Flahavan's oats are a family favorite - we love eating them for breakfast - they make the creamiest and smoothest oatmeal. They are also terrific for using in recipes like this. This pie will serve about 8 people and it's a perfect dessert for using up apples after apple picking this fall. In a large bowl, stir together the oats through salt. Stir in the melted butter until well-combined. Press the mixture into a 9-ich pie plate, trying to get it in an even layer without any holes. Bake for 10 minutes. While the crust bakes, prepare the apples and cream filling. In a large glass measuring cup or medium bowl, whisk together the heavy cream through salt. Arrange the apples in the crust in an even layer and spread the cream mixture over the top. Bake for 10 minutes then reduce the heat to 350 degrees and continue to bake for another 35-40 minutes, until the filling is set and the apples are tender. Let cool before slicing. Cover and refrigerate any leftovers. and check out all of today's recipes! I love oatmeal so making an oatmeal crust for an apple pie sounds amazing! I happen to have some oats just looking for a recipe. This looks delish! This is a delicious looking pie. This reminds me of an apple pie at one of my favorite restaurants but with a different crust...it sounds great. Creamy apple heaven...loving this pie! Thanks for sharing on Friday Frenzy! I am all about an oatmeal crust! Sounds so yummy. Pinned!! 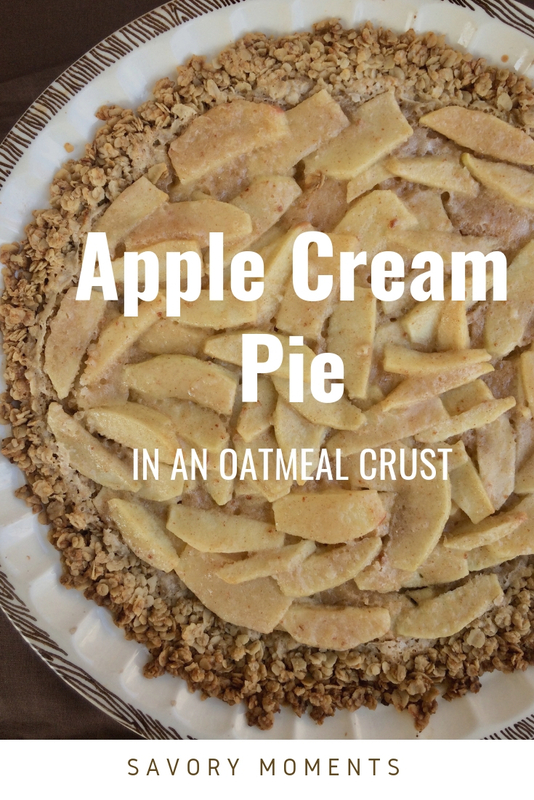 I am loving your oatmeal crust...sounds delicious with the creamy apple with it. Fantastic recipe Amy...have a wonderful week! what a unique apple pie! i love the way it looks and i'm sure i'd love the way it tastes.